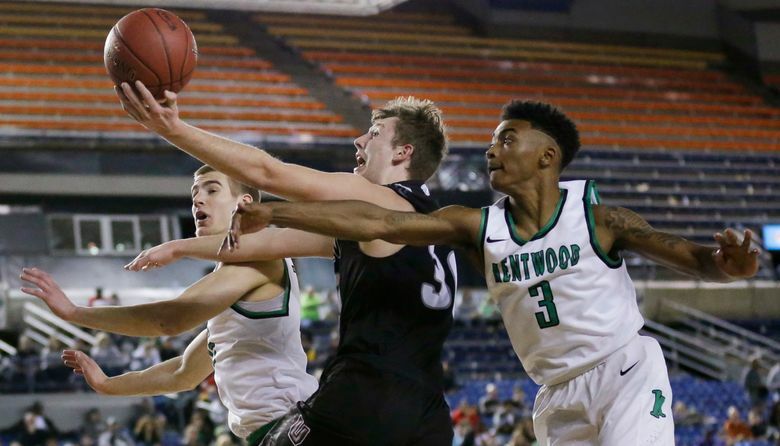 TACOMA – Kentwood turned up its defensive pressure enough in the third quarter to frustrate top-seeded Union and win the Class 4A boys state championship game 81-61 on Saturday at the Tacoma Dome. The Conquerors (27-3), seeded fifth, held the Titans (21-5) to seven points in the quarter, flipping a two-point halftime deficit to a 13-point lead. Senior Rayvaughn Bolton had the key three-pointer early in the fourth quarter, shaking his head “No” as he ran back to play defense, emphasizing to Union that a comeback was unlikely. Union coach Blake Conley pulled his starters with two minutes left in the game. Bolton, 6-foot-2 guard, led four teammates who scored in double figures with his 19 points. The teams nearly matched each other shot for shot in the first half. Union took a 39-37 lead into halftime off a putback by senior forward Kai Gamble with five seconds on the clock. Both teams shot better than 55 percent from the field. But Union guard Cameron Cranston was particularly deadly, leading his team with 20 points in the half. Cranston only scored two points in the second. His team shot 28.1 percent from the field after the break. Kentwood was counting the days to the championship game. It lost 66-54 to Federal Way in the title game last year. This was the Conquerors third straight tournament appearance and first title since 2010. Union made its sixth overall state tournament appearance. It won the Class 3A title in 2010 and placed third in 2012. The Titans defeated Kentwood 76-69 in December. Kentwood powered back with a 75-71 win in the district playoff semifinals and then Saturday’s championship victory.